Bit of a hectic time this weekend, moving house is always stressful but even more so when you have a party to attend in Oxford on the same weekend and then your removal van and driver doesn’t turn up on the day…meaning you are stranded on the street – although at least we were comfortable as the sofas were outside! 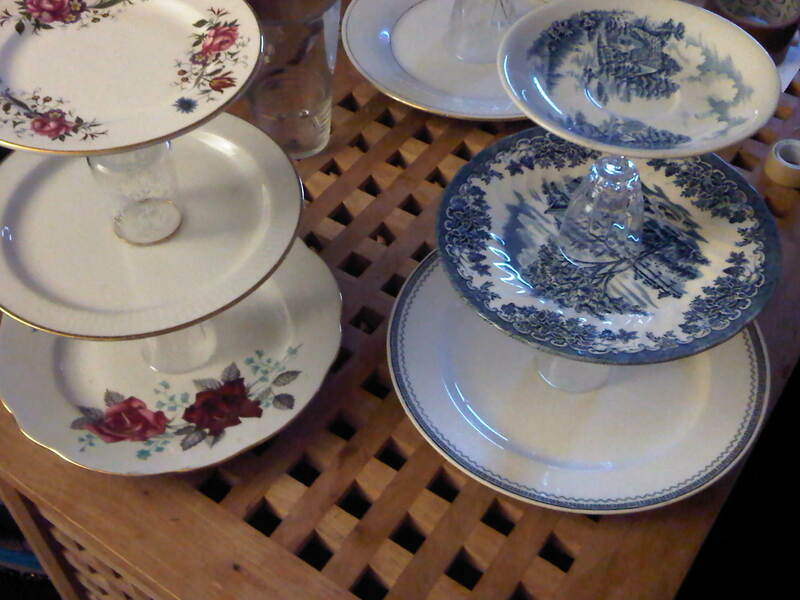 On the bright side my lovely friends suprised me in the afternoon with a picnic on Primrose Hill for my birthday, and two more cake stands found a lovely home after an early morning delivery on Saturday. 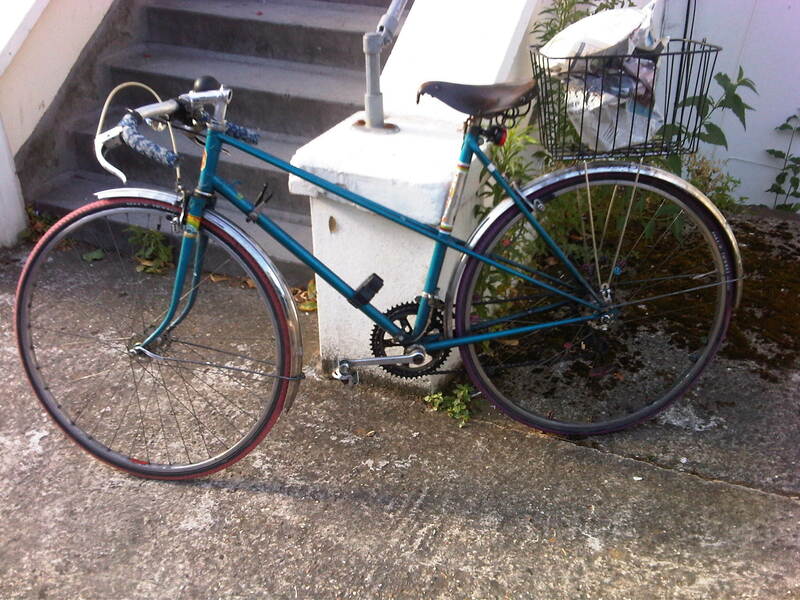 Thanks to Pierre I was able to whizz round on Saturday morning, then freewheel back down Regents Park Road before hightailing it to Oxford for a picnic. This is trusty Pierre in action early on Saturday morning, with his cargo. 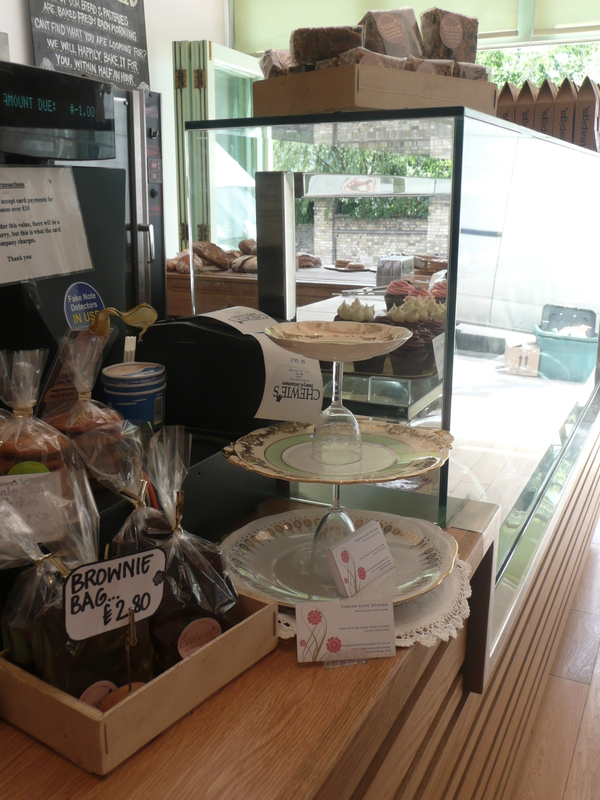 A Cariad cake stand has found a lovely new home in Chewies Bakery on Haverstock Hill, near Chalk Farm Tube. There it is! This one was made specially for Chewies using some green, white and gold plates – to go with the theme in the bakery. 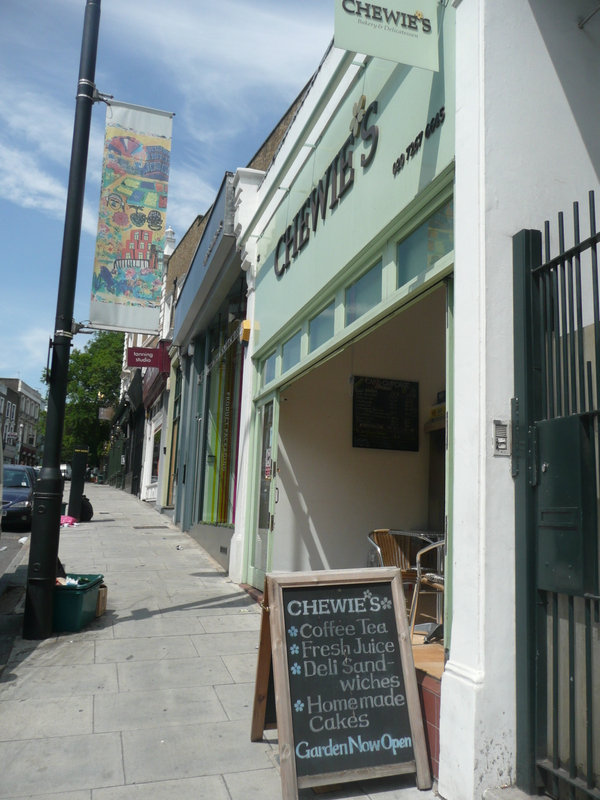 I’m a big fan of Chewies, it’s a short walk from my house, and I pass it most mornings on a run up to Hampstead Heath – which is a killer as it opens at 7am and it requires immense willpower to not just think ‘ah skip the run I’ll get a croissant instead’ when you run past and smell the coffee. It’s also where I went with my boyfriend at 8am one weekend morning after being in A&E at 6am with a football injury (him, not me! ), so you know – fond memories. 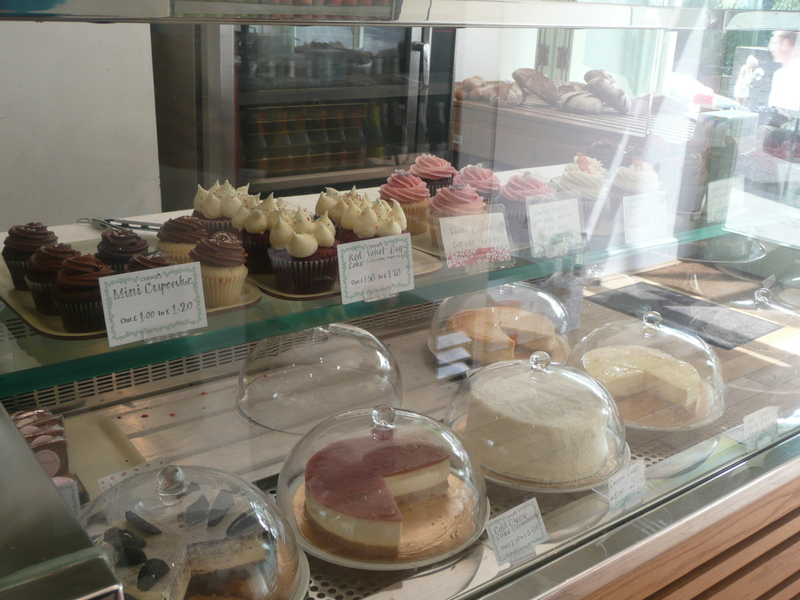 They also do heaps of other homemade cakes…and scones with homemade jam…ooh I could stay in there for days! 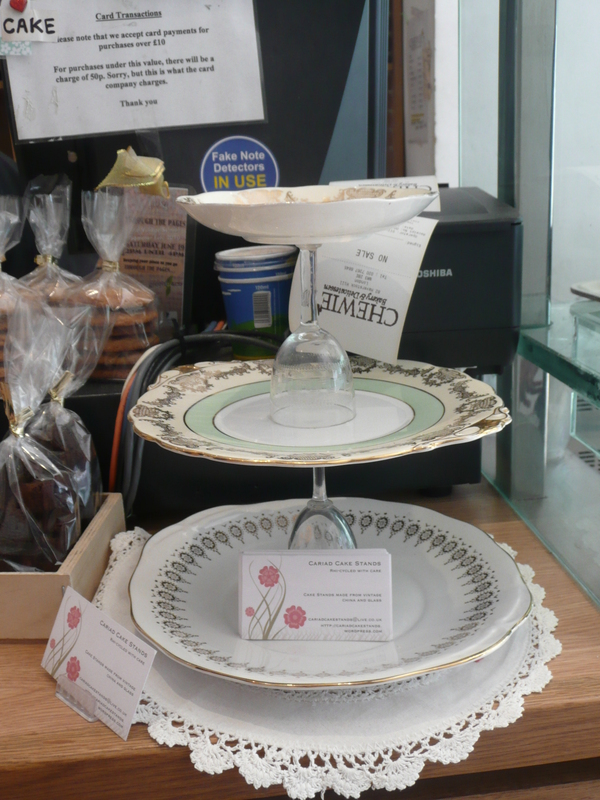 The cake stand is sitting pretty by the till, with some of my cards – so hopefully they might get picked up, so to speak. 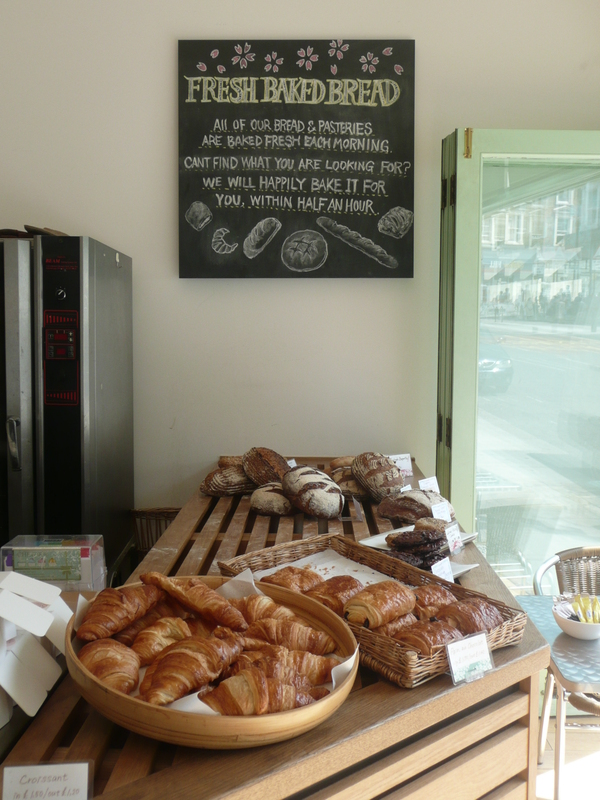 I like to think it’s found a happy home, and gets covered in cakes every day – it’s a dream life. 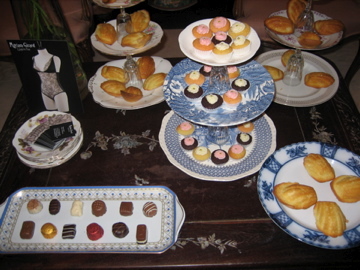 The cake stands got a bit of a treat last week, as they were used for a party to celebrate the launch of a new lingerie line by the very talented Myriam Girard for her label House of Girard. Myriam is a french girl living in London who launched her business last year by herself, after a career change from banking, and the pieces definitely have a french feel about them – just the type of thing to wear whilst eating teeny little madeleines from your bespoke cake stand whilst entertaining guests in your boudoir…well I can dream. Check out her website, and get someone to buy you some – quick get in before everyone else does! Hello and welcome to Cariad - for information on my cake stands & vintage china, details on which markets I will be attending and my adventures - as each stand is individual and sometimes takes a long time to hunt out... If you want to provide a happy home to one of the stands please contact me on cariadcakestands@live.co.uk and I will be happy to discuss what you're looking for and try deliver the perfect one!